Dhanush's father is an alcoholic who would hurt his mother. He would waste the family's money on drinking, so Dhanush was not able to go to school or have adequate food and clothing. 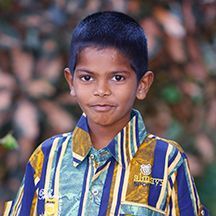 Sponsorship would provide Dhanush with an education and basic needs.